Kaya Palazzo Golf Club was opened in November 2007 and was immediately a great addition to the golfing landscape of Belek. This par 71 layout is beautifully located, where the native pine forests set the scene for a majestic championship setup that has now established itself as a top class golf course, in Turkey's golfing capital. We found 24 offers matching your search. 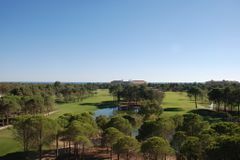 Some 750,000 square metres of spectacular pine forest are the backdrop for Kaya Palazzo, which is one of the more recent golf courses to have been opened in Belek. Master PGA Professional David Jones set out to create a course which is not extremely long like many of the recent courses worldwide, but would provide a strong challenge for every player. At its peak, Kaya Palazzo Golf Club is less than 6,500 yards long, but the imaginative design ensures that visitors are faced with demanding yet beautiful holes that are certain highlights of any golf holiday in the popular Belek region.